Many times working with clients in their kitchen, we come across an abundance of cookbooks, cooking magazines and boxes of loose recipes. If someone loves to cook, it can be hard to encourage him or her to do some purging of these many items … even if they have no more room to house them. If you find yourself in that same position, here are a few simple ideas to help you with your abundance of cookbooks and recipes. There are many websites such as www.AllRecipes.com to help you find all types of recipes. Hence, there is less and less reason to hang onto recipes when they are so accessible via the Internet. Don’t print them out. Read from your computer or Smartphone. If it’s a good recipe and your family enjoyed it, then either create a PDF file on your computer or print if you want to have a “hard” copy. But only print if you really have the space to store it. Do you have an abundance of recipes coming from Magazines and have your tried them yet? Gather those you tore out from a Magazine and categorize them. Then try to determine how long you have had them. If it’s been longer than say 6 months, consider tossing. When you are tempted to cut one out of a magazine again, put the date on it and a time limit as to how long you will hold onto it before realizing you won’t make it. Then toss if you haven’t made it! Does family members keep feeding you recipes and you aren’t even trying them? Hmm … is there a nice way to ask them to stop? You can tell them that paper overload is getting you down. Do some of these recipes have ingredients that you don’t know what they are? Consider tossing those recipes. Do some recipes have ingredients that you would purchase for that recipe only and probably not use again, then consider tossing the recipe? Why have ingredients you probably won’t use again taking space in your cabinet? Do some of these recipes require appliances you don’t own and probably won’t buy? Then toss; no reason to hold onto something you definitely cannot make. Group your loose recipes by type. If there is an abundance in one specific area, say chicken dishes, then consider cutting it down to 2-3 recipes for chicken that you would like to try. 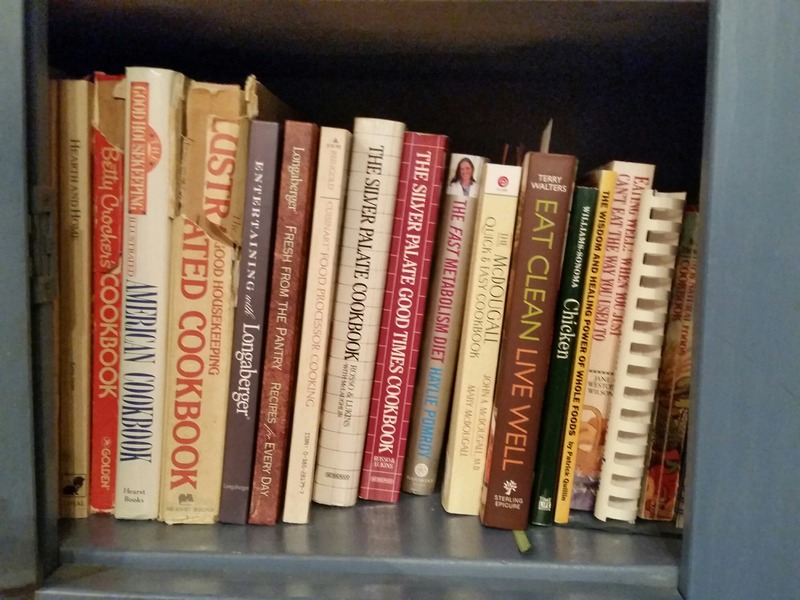 Determine how much space you are willing to allocate for cookbooks and/or recipes. Only keep them in this designated area and purge what doesn’t fit. When you are tempted to purchase another cookbook or cut out another recipe, determine which ones need to go so you can put in the new. Hope you find these ideas helpful as you streamline your cookbooks and recipes. And as always, if this project seems too overwhelming for you, call your local Professional Organizer. We can help you navigate this process. Sabrina – I love that idea. Then you can take a tablet nicely positioned on your counter and cook away. Great idea. I use an app called Pepperplate to store my recipes. On many cooking websites, I can just click to add a recipe to my app, and I can then access whether or not I have an internet connection, as well as editing to suit my taste. I like that Janet. Will check that out. Thanks for sharing.